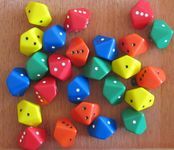 Custom d10 with pips instead of numbers. They come in five different types, with different numbers of pips on the faces. Other than the core rules, these dice are all you need to play.